The essence of red is extremely popular during several major holidays of the year. Collectors find many ways to utilize their glass. For certain times of the year for instance, like Memorial Day, Independence Day and Veterans Day, red is mixed with milk glass and cobalt to create a red, white and blue display for celebration of these patriotic events. For this past February, Ruby was mixed with milk glass to create a special look for Valentines Day. Ruby is mixed with green in December for a Christmas décor. The allure of the Ruby gem stone has been a favorite of gemologists in designing unique pieces of jewelry. It could be this fascination of the Ruby gem is what led the glass companies to develop a formula that would imitate this color. Ruby glass was first made in Europe during the Roman Empire. Then, it seems there was an absence of this color for many centuries. The why is not known for sure, but possibly the formula got lost or chemicals just weren’t available. By the time the 1600s come along, Ruby glass is again being made and has continued to the present day. We have all heard through the years of the fable about gold coins being put in the glass mixture to create the ruby color. Like most stories, this is only partially true. Minute amounts of gold are added to the glass batch but it must be in a special suspension state. The glass will only achieve its final color upon reheating the item in the glory hole. In its molten state, the glass resembles an amber color. Magically, upon reheating the glass will turn into a ruby color. This glass is known as a heat sensitive glass since it only attains its final color by this process. The glass made early on was hand blown. A Copper based formula also enabled the glass companies to make machine made Ruby. Later, the addition of the chemical Selenium allowed the glass companies to be able to hand press this glass. European workers that immigrated to America were instrumental in developing Ruby glass here in the mid 19th century. Some of these early companies were: Hobbs Brockunier and Mt. Washington. Later many other American glass companies produced Ruby. In 1999, we had several conversations with Frank Fenton while trying to decide which of the Fenton patterns to include in our first book titled Elegant Glass. 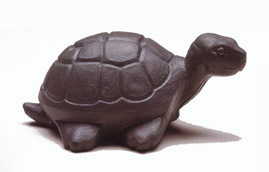 In talking with Frank he generously supplied us with additional information on Fenton’s early glass making. He felt his company was the first to develop a formula using Selenium to enable Ruby to be pressed. Early Ruby production began in the teens with the development of Carnival glass, followed by Stretch glass in the 1920s. Fenton was the top producer of Red Carnival glass. The free hand art glass from the mid 1920s also used red glass. It was in the 1930s that Fenton proved that it was the true leader in Ruby production. Some of their patterns that were made in Ruby included Basketweave, Big Cookies, Dancing Lady, Diamond Optic, Georgian, Lincoln Inn, Plymouth and Sheffield. In our Elegant Glass book we included the dinnerware patterns of Diamond Optic, Lincoln Inn and Plymouth. During the 1940s, Ruby was scarce at Fenton. A Ruby Overlay was made during this time which utilized a gold based Ruby that was cased with Crystal glass. A full line of Ruby didn’t come back until the 1960s. At this time items were made in Hobnail and Thumbprint. Ruby Carnival was reintroduced in the 1970s and continues to be offered at different times. The former Ruby Overlay color was given the new name of Country Cranberry when it was reintroduced in 1985. Through the years Ruby has continued to be part of Fenton’s lines. Ruby glass has also stayed as an addition of Fenton’s annual Christmas lines. It is interesting to note that of all the major American companies that made elegant glass, Heisey wasn’t able to develop a true Ruby production color. Their Tangerine color can sometimes take on a reddish hue. In addition Heisey did develop a Gold Ruby experimental color. The Cambridge Glass Company was founded in Cambridge, Ohio in 1902. It would take the company about 30 years to develop a deep red color. First produced in 1931, their red color was given the name of Carmen. The ruby glass was the first color to start in Cambridge’s developing line of darker transparent colors. This color was produced off and on until the company closed in the 1950s. Many of the ruby pieces had gold applied to the etching to develop an attractive gold encrusted design. The George Duncan and Sons Company opened in 1893 in Washington, Pennsylvania. Through the years the company underwent many changes. The name was changed to Duncan and Miller in 1900 with the addition of partner John Miller. Duncan developed their ruby color about the same time as Cambridge in 1931. Ruby was the color Duncan choose to name their red color. Just like Cambridge, Duncan’s Ruby color continued during various times until Duncan closed in 1955. Hocking Glass began life in 1905 and then over 25 years later merged with Anchor Cap & closure to become Anchor Hocking. Their red color called Royal Ruby had a deep red tint to it. Hocking’s glass was all machine made. This was probably their most popular color during the 1940s and 1950s. Many different pieces were made in Royal Ruby. Hocking’s other favorite color was Forest Green and is frequently used with Royal Ruby during Christmas time. Today, they are the largest producer of glass tableware in America. Fostoria Glass was founded in its namesake town of Fostoria, Ohio in 1887. The gas supply disappeared four years later and the company was relocated to Moundsville, West Virginia where most of their investors lived. Fostoria’s first venture with red glass was in 1935 with their introduction of Oriental Ruby. This color never appeared in their catalogs but it is shown in many of their advertisements and brochures. Ruby glass soon disappeared from Fostoria’s line and didn’t reappear until the 1960s. The Crown line based on the royalty crowns from Europe appeared in 1960. Ruby was also continued in the Heirloom collection. A few pieces of American were also made in Ruby at this time with also Viking Glass producing Ruby American for them. The Argus collection was made in Ruby for the Henry Ford Museum from the late 1960s to early 1980s. Pieces from this special arrangement bear the letters of HFM embossed in the glass. Fostoria closed in 1982. New Martinsville Glass opened for business in 1901 in New Martinsville, West Virginia. During the 1920s, they were well known for their colors. By the early 1930s, New Martinsville was in need of a good selling dinnerware line. General Manager, Ira Clarke had designed a new line designated as #37 and thought it could be a good seller for New Martinsville. The line took off as the public loved its look. At this same time, Ruby came into existence and many of the pieces were made in this color. Line #37 is known as Moondrops to collectors today. The Radiance and Janice patterns were added a few years later to New Martinsville’s line and both were enormously popular in the Ruby color. After New Martinsville first closed in 1944, then was reorganized and then reopened as Viking, the Ruby color continued. Many of their animals and Epic line were made in Ruby. The color continued to be popular until Viking closed in 1986. As a special order for the Smithsonian Museum gift shop, Viking reproduced the Diamond Thumbprint pattern that was originally made by the Boston & Sandwich Company in the late 1880s. All of the original pieces were only made in Crystal. All of these new pieces were embossed with the SM letters. After leaving New Martinsville Glass, David Fisher worked to get a new glass factory established in Paden City, West Virginia in 1916. From the beginning of their existence, Paden City was a producer of vibrant colors. 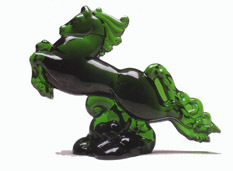 They primarily made glass for other companies and distributors which made their glass hard to identify in the beginning. Sales were rapidly increasing by the end of the 1940s and Paden decided to expand by purchasing American Glass. This unfortunately turned into a financial nightmare and forced Paden’s closure in 1951. The LG Wright Glass was owned by Si Wright and was also located in New Martinsville, West Virginia. It is strange to note that even though they were called a glass company, they never made any of their own glass. Si would buy up glass moulds from defunct companies and then hire operating companies to make the glass for him. Fenton, New Martinsville, Paden City, Smith and Viking all made glass for Wright. Morgantown Glass Works was located in the namesake town of Morgantown, West Virginia. It seems as if the early 1930s was the time for red glass to become popular at many of the companies. Morgantown was no different. Spanish Red was introduced in 1931 and described as a very rich looking color. Through the years, red continued to be part of several patterns until Morgantown closed in 1971. The LE Smith Company was located in Mt. Pleasant, Pennsylvania. This company had many colors as part of their regular production, but it wasn’t until the 1960s, that Ruby began to be made at Smith. Their red carnival was also extremely popular in the 1970s and 1980s. During the American Bicentennial, Smith issued several patriotic items in their red color. They had a lot of difficulty maintaining a true red color. The Westmoreland Specialty Company founded in 1888 was a primary producer of Milk Glass and that color continued to be their mainstay for many years. Even though applying a Ruby Stain was popular in the 1930s, the solid color of Ruby wasn’t introduced until the late 1970s. Once put into the collection, Ruby became very popular with the public in many of the patterns. Ruby was still being made when they closed in 1984. All these above glass companies produced some very beautiful red glass in terrific shapes and patterns. It is no wonder that Ruby was a favorite of yester year and still continues to attract new collectors today.